What was supposed to be a heartwarming family movie is turning into a horror show. And it doesn't sound like it's going to turn out well for anyone involved. Earlier today, TMZ shared a very disturbing video that shows a German Shepherd being forced against its will into rushing water on the set of A Dog's Purpose, where the canine actor almost drowns before being rescued by trainers. Now, PETA has gotten a look at the footage, and they are calling for a boycott of the movie, which is scheduled to hit theaters on January 27. The footage in question was secretly captured in Winnipeg, Canada back in November 2015, during a second unit shoot. The video clearly shows a frightened dog being forced into rushing water by its trainer. The scene called for the canine to rescue a child from drowning, but it wasn't moving forward as planned. The dog actor is forced up against the edge of the pool by the flow of water as the trainer calls out. The dog then becomes submerged completely. There is panic, as trainers swim to the dog and save it from drowning, and you can hear, 'Cut it! Cut it!' being called out. Says TMZ about the footage. "Sources connected to production tell us 8 outboard motors were used to churn the water and recreate a rushing river. The dog eventually got in the water, or was forced in, but was quickly submerged...We're told director Lasse Hallstrom was present the whole time, and at least one member of the crew was extremely disturbed by the dog's treatment during this scene." Amblin Partners and Universal Pictures released this official statement. "Fostering a safe environment and ensuring the ethical treatment of our animal actors was of the utmost importance to those involved in making this film and we will look into the circumstances surrounding this video." Producer Gavin Polone, who is a known animal rights activist, was not on set the day this second unit footage was shot. And he claims to be horrified by the video. In asking audiences to boycott the movie, PETA is targeting Birds & Animals Unlimited, the animal supplier reportedly responsibly for handling the dog. Though, it is not yet clear if they are the actually animal handlers who were on set that day with the dog. BAU reportedly told an undercover investigator for PETA that they were responsible for supplying all of the dogs for the movie even though IMDB lists two different animal handlers. Those named have not been confirmed to work for BAU. The company's website has been offline since the video leaked. And it's a company that PETA has been trying to expose for a long time. A Dog's Purpose is coming from Amblin/Walden Media based on the bestselling novel of the same name by W. Bruce Cameron. The story follows the soulful and surprising journey of one devoted dog who finds the meaning of his own existence through the lives of the humans he teaches to laugh and love. 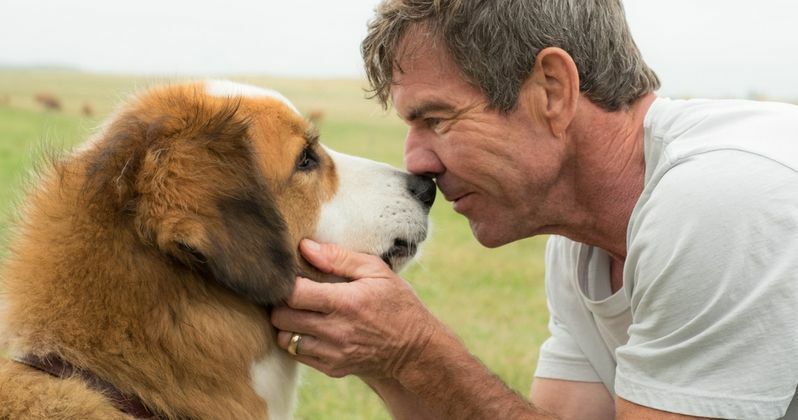 Dennis Quaid, Peggy Lipton and Britt Robertson star in the movie with Josh Gad voicing the dog. Says Lisa Lange, PETA's SVP. "This movie is directed towards those who love dogs and, clearly, this is not a dog's purpose." Producer Gavin Polone had this to say about the video. "I'm horrified by this. The first thing I asked was, 'Is the dog OK?' He's fine. But if I had seen that, I would have stopped it in a minute. People have to be held responsible for this. It was someone's job to watch out for this kind of thing. Why didn't they? This is something I've written about before, whether it be circus animals or animals on set. American Humane are supposed to be there supervising. That's their job that someone is paid a lot of money to do. Why wasn't this stopped? There needs to be a better system than this. That's what I've called for in the past. I agree with PETA that they not only need to make sure animals are treated properly on set, but they also need to find out where the animals are kept outside of the set. To make sure they are treated properly at all times." American Humane issued the following statement. "American Humane has reviewed the video and we are disturbed and concerned by the footage. When the dog showed signs of resistance to jumping in the water, the scene should have been stopped. We are placing the safety representative who was on the set on administrative leave immediately and are bringing in an independent third party to conduct an investigation into this matter." Producer Gavin Polone went onto explain that the treatment of animals on this particular set was of great concern to him before filming even began. He was concerned about one scene involving a cat, and another involving a fire, but both scenes used CG, and were composite shots, which never put the animals in any kind of danger. Polone claims that he was on set 70% of the time, and never saw any of the animals in distress, or the trainers stressing out the animals unnecessarily. About the timing of the leak, which comes just a few weeks before the movie's release and could definitely hurt it at the box office, he says this. "I hope that bringing this out leads to better treatment of animals. I know the studio is outraged and investigating this. And by the way, this happened in October of 2015 and not only did none of us hear of it, this should have been investigated immediately. Who waited a year and three months to call attention to this? That's wrong in itself." A Dog's Purpose trailer is said to contain footage that was shot during this second unit shoot, which shows the German Shepard trying to swim through rushing water. You can see the embed of TMZ's footage here along with the trailer.